Woo Tae Seok (Shin Ha Kyun) is a lonely veteran detective who dedicates his life to solving crimes. Later, he crosses paths with a female psychopath (Lee Seol), but he is unable to arrest her due to a lack of evidence. Eventually, she becomes of significant help to him when it comes to busting crimes! Shin Ha Kyun first gained recognition with his role as a young North Korean soldier in Park Chan Wook’s smash hit Joint Security Area in 2000.Thereafter, his popularity rose steadily with strong roles in movies like Sympathy for Mr Vengeance (2002) and Save the Green Planet (2003). He has also found success on the small screen, with one of his most iconic roles being a cold, ambitous neurosurgeon in Brain (2011). That role also won him a Daesang at the 2011 KBS Drama Awards. An up-and-coming actress, Lee Seol has appeared in a variety of movies and dramas this year since her recent debut. 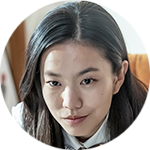 She is best known for her role as Young Ran in After the Rain (2018).